Thousands of protesters have come out onto the streets of Hannover to say 'No' to the controversial TTIP US-EU trade deal. Many in Germany fear it will reduce consumer protection and undermine workers’ protection. While the Transatlantic Trade and Investment Partnership (TTIP) between the US and Europe is set to create the world's largest free trade zone, many Europeans worry that the agreement would elevate corporate interest above national interest. 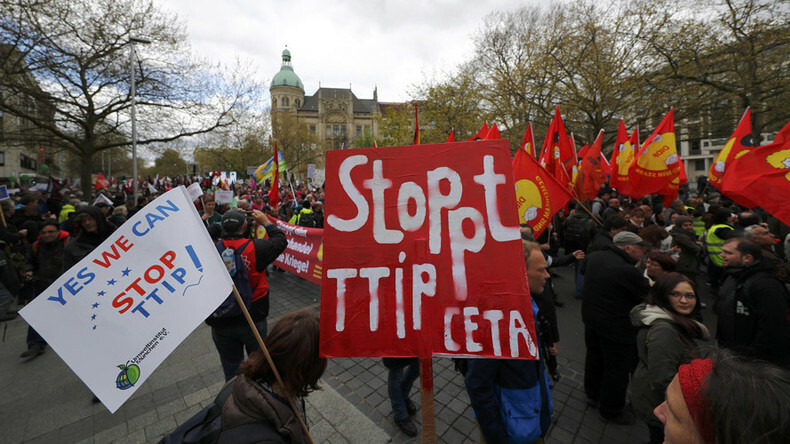 TTIP opponents say that cheaper goods and services would only hurt the EU and help the US. — Anastasia Churkina (@NastiaChurkina) 23 апреля 2016 г. “People say the deal is going to compromise the European Union sovereignty, and would create much more secrecy, with one of the biggest concerns being that the agreement is wrapped in a big veil of secrecy that people are not happy with,” RT's Anastasia Churkina reported from Hannover. John Hilary, the executive director of War on Want, an anti-poverty charity, told RT that large sections of the general public stand to lose out if TTIP is passed. Hilary was also damning about how TTIP has been “pushed down people’s throats” by an unelected EU. He also mentioned that if the legislation is passed, it would give American companies alarming cross-border powers. “There will also be courts where US companies will get this power for the first time to sue our governments in Europe if at any time there is a new law or regulation introduced, which threatens their profits. This is an extraordinary threat to the rule of law and democracy and our chance to build a better future,” he said. The US is Germany's biggest trading partner. German Chancellor Angela Merkel is set to discuss the TTIP deal with Obama when he visits a trade show in Hannover on Sunday and Monday. — Castor Nix Da (@castornixda) 23 апреля 2016 г. "The Transatlantic Trade and Investment Partnership is one of the best ways to promote growth and create jobs," the US president stressed in an interview with Bild. Wrapping up a deal would be a "win-win situation," Angela Merkel announced in her weekly podcast, adding that "it is good for us as we will be able to appraise our competitors." — Marcel Böttcher (@73inches) 23 апреля 2016 г. — Stop TTIP (@eci_ttip) 23 апреля 2016 г. Public support for the transatlantic trade deal has meanwhile been weak. According to a recent survey conducted by pollsters YouGov on behalf of the Bertelsmann Foundation, only 17 percent of Germans think the TTIP is a good thing, down from 55 percent two years ago. In the United States, only 18 percent of people now support the deal, compared to 53 percent in 2014. Nearly half of US respondents complained about a lack of information, saying they did not know enough about the agreement to voice an opinion.